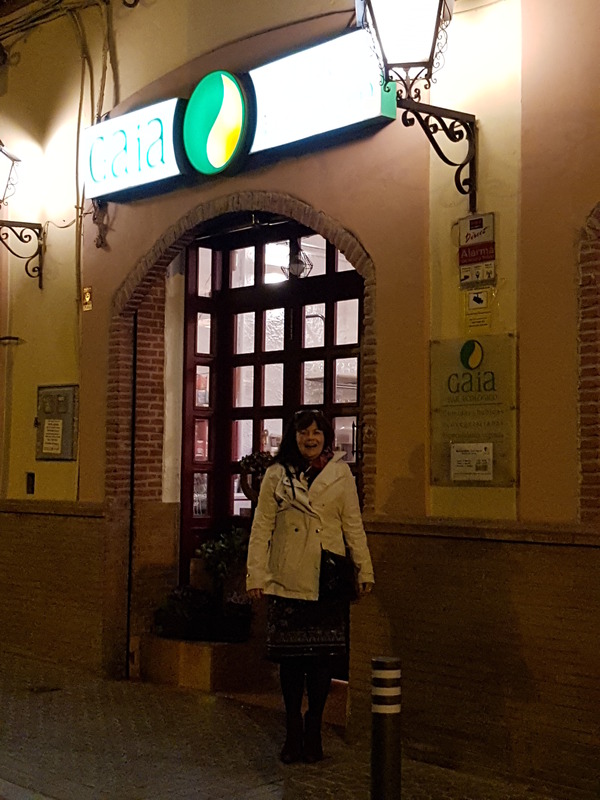 Seville in December – where did we eat? Breakfast is not so difficult. There are plenty of cafes doing it; though what constitutes breakfast is mixed. In Seville there is lots of Churros and chocolate sauce. Churros are long and thin doughnuts. More to our liking was warm croissant with jam. Easy. Coffee comes as leche (with milk), solo (espresso) and Cappucino. For meat eaters, add ham. And ham. We have frequented a locals’ place called Picatoste. It’s fast, furious, loud, of mixed clientele. And inexpensive. We’re off there now. Seville is full of Tapas. I recall a few years ago in Malaga finding many veggie options; not least aubergine and courgette. But Seville (and Cadiz) serve largely tapas with fish and ham. There is one place, though. Habanita is tucked away in an alley near to the cathedral. It is meat and veggie – the latter predominating. Not only can you get aubergine, but also banana balls, garlicked yucca, wok-ed vegetables, stuffed pepper some sort of black bean pancake thing and even veggie steak (we didn’t try it). 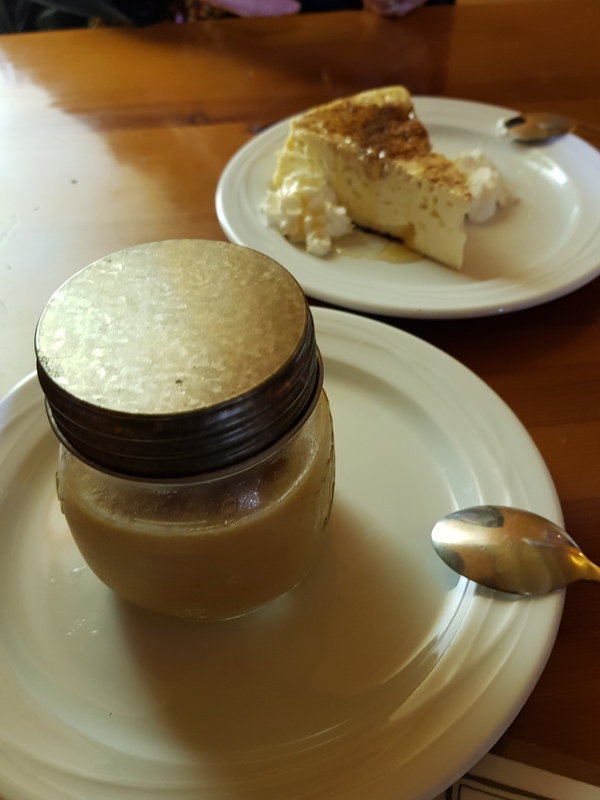 For dessert, the caramelized apple custard is a must (right). We also had cheesecake. Interesting. The online reviews are mixed; in relative terms, it is inexpensive, cheerful, cosy and welcoming. The only exclusively veggie place we found was Restauranto Ecovegetariano Gaia. We had a couple of visits with mixed results. The set menu is probably best avoided as the better dishes are excluded. For example, there was a tofu/spinach egg-less quiche that lacked something. By contrast, the sauteed bulghar, tofu and vegetables was great as were the pasta and salads. A couple of vegan cakes for dessert finished off the meal nicely. If one has to do battle with the tapas bars, then there are some hidden veggie dishes. At one place we had gazpacho – a cold tomato and cucumber soup. It came with grilled aubergine, courgette and mushrooms. Excellent. There are a number of variations: Salmorejo, for example. This comes without cucumber and is topped with olive oil. We also got served spinach and chick pea stew. It was not stew at all! But very welcome. 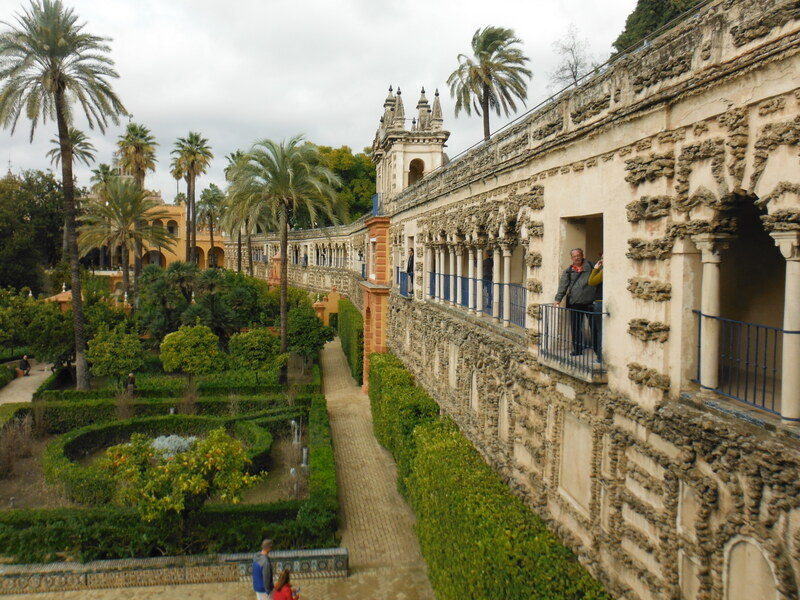 The Alcazar stands adjacent to the cathedral and is a UNESCO world heritage site. A palace and seat of power and repression for a thousand years. It was thought to have been founded in the eighth century and maasively expanded in the eleventh century to serve as the great court of the Abbadid dynasty. 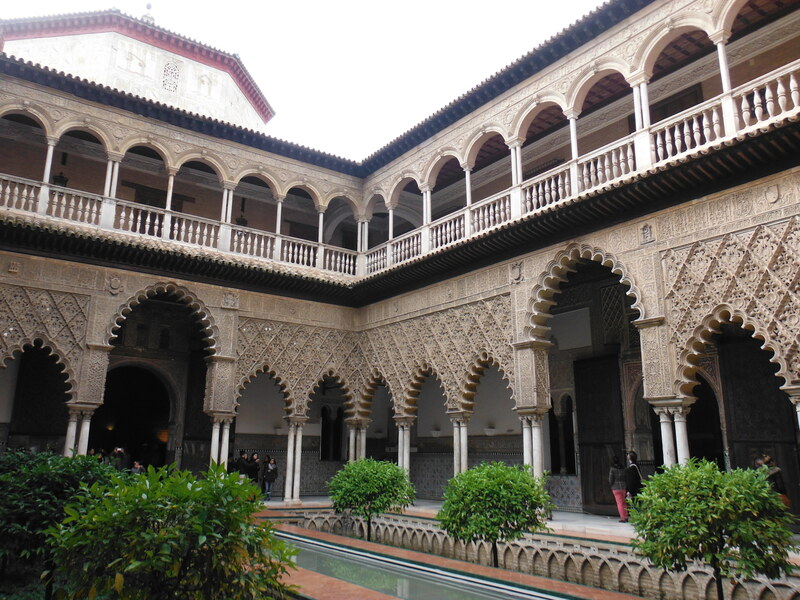 Seville was the favoured residence of four centuries of spanish kings. In the twentieth century, it found favour with Franco and in the present day is home to current spanish monarch when visiting Seville. For good reason, it is certainly a tourist attraction. Without an advanced booking we waited 3 hours to get in. Take something to read and drink. Inside one is confronted by all of the architecture, design and colour that one would expect from a clash, complementarity and contrast of Moor and Spanish aesthetics. Ornate carvings, exquisite 15th century ceramic tiles – I love ceramics – and amazing gardens complete with fountains and live peacocks (an important symbol captured in the decor). 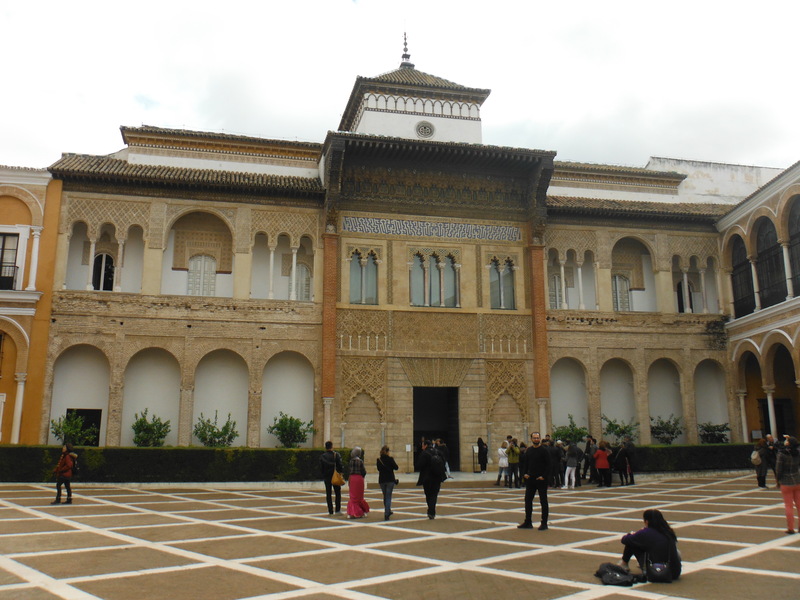 I have to say that I did not work out the logic of the building with its many courtyards and significant rooms; for example, the eye-shattering Ambassadors’ Hall (below left). There is actually a maze in the garden, but the palace itself is sufficiently labrynthine to not need to get further lost, unless one has children. One of the first courtyards is that of the maidens (below right). It has a longitudinal pond with dipped gardens around it. 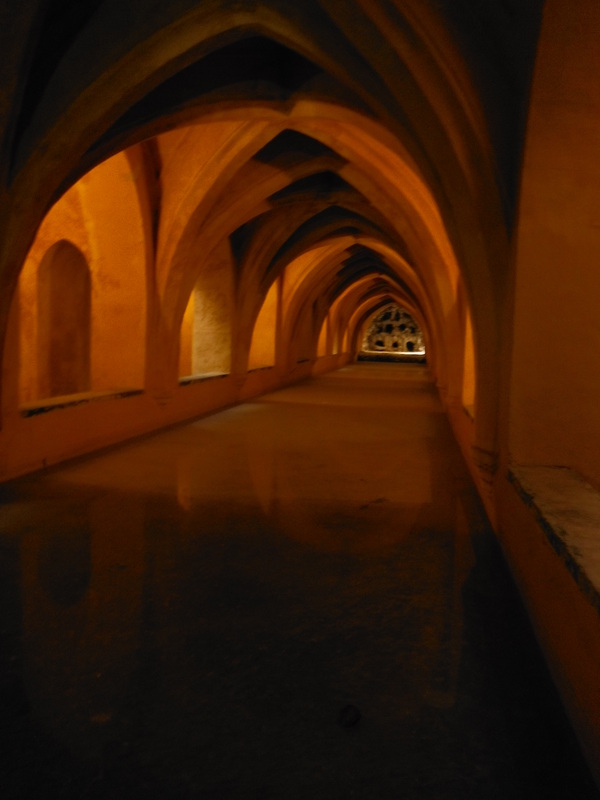 The arches are lobed and in Mudejar-style. The ceramic tiles adorn the outer walls. 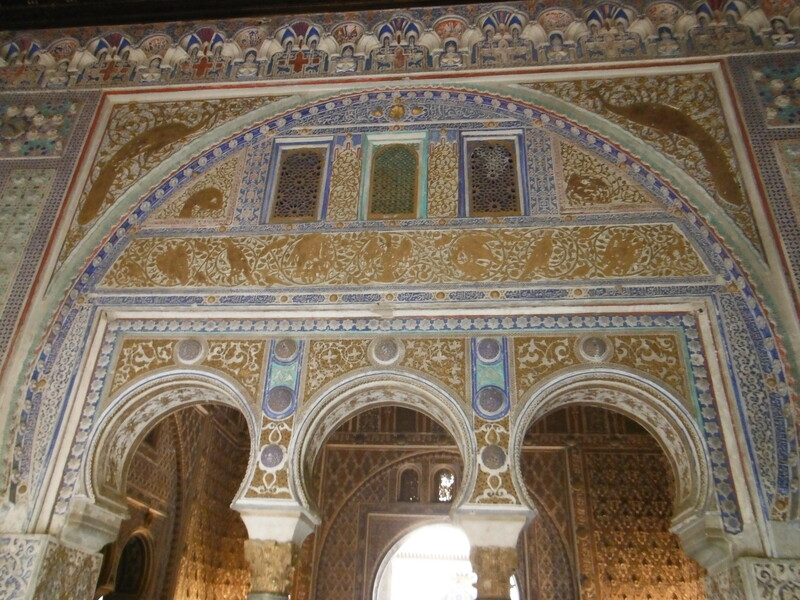 The caligraphy is arabic and contrast with the renaissance-style of the upper floor/gallery. It is not possible to walk on the upper gallery, but the guidebook highlights the existence of renaissance wedding medallions and coats of arms from the period. The Ambassadors’ Hall is the show-off room where official receptions were held. It has a golden celestial cupola that is visible from outside and and lavishly decorated from the inside. It is not particularly well lit, So the guide pictures are much better than what we can manage with our gadgets. This is particularly true of the Hall of Justice with its stucco decoration. Already very brown from the plaster, the shade – and my struggling eyesight – render the fine plasterwork short on detail, of which there is much – largely drawn from nature; leaves, flowers and shells (fertility). The tapestry room has five large tapestries cascading down the walls. One is a lesson in developing cartography, the operative word being developing. 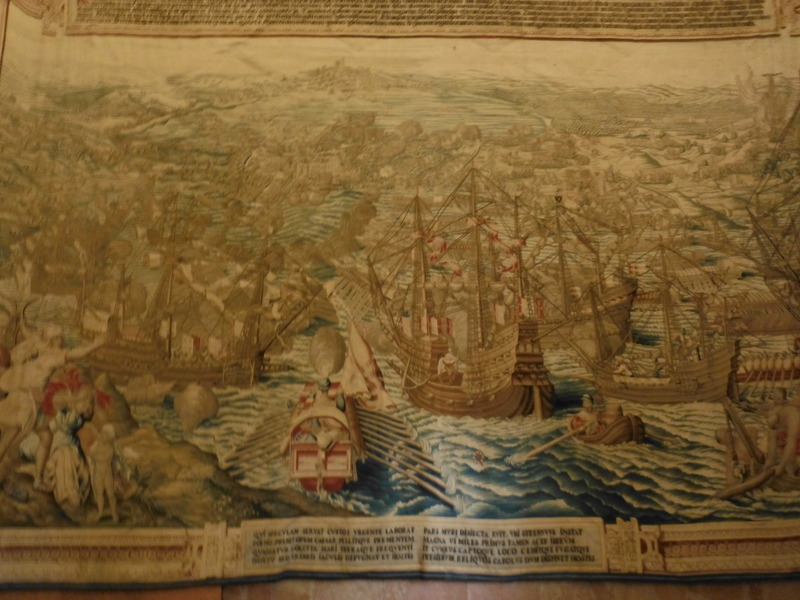 There is also a magnificent depiction of Spain’s victory over Tunisia in June 1535 (the tapestry was comissioned by Philip V 200 years later, right). And finally, the sub-terranean bath (left). It is a suitably cool space. It’s big, so presumably it is for sharing. 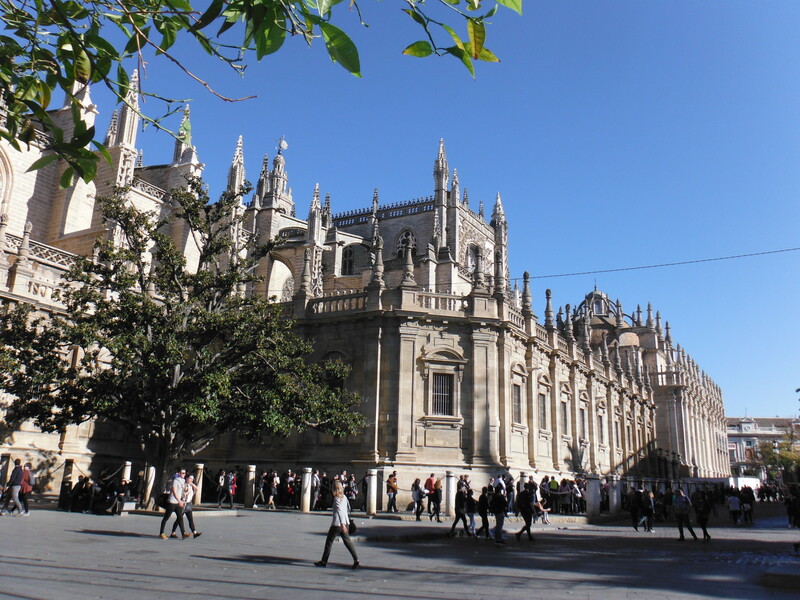 Seville is the location for the largest cathedral (left), by volume, in the world. It’s gothic old, dating from 1506. Expect to queue to get in – it took us about 30 minutes. But once in, there is plenty of space for all. And more. So, What to look for? Well, in many respects the cathedral is a museum and gallery (with each chapel acting as a themed room). 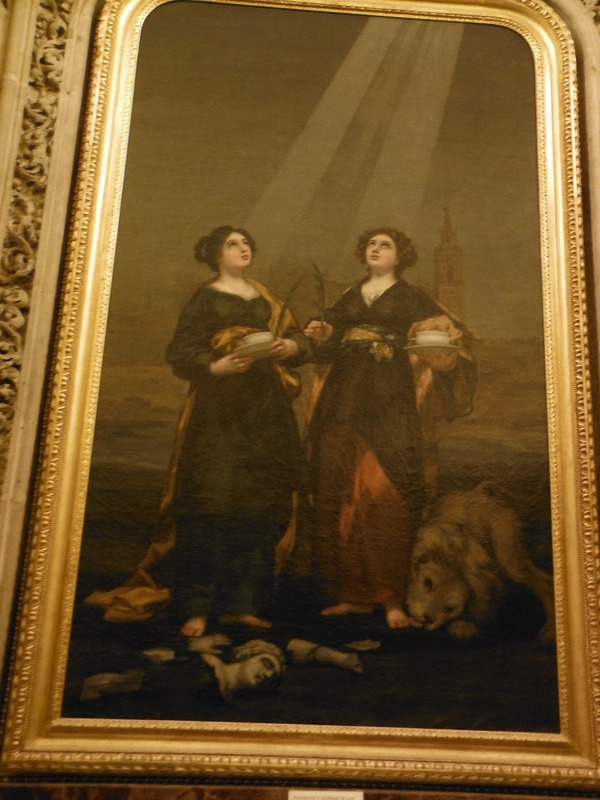 There are some notable pictures – Goya‘s Santas Justa y Rufina (right) depicting the two pious sisters tortured by pagans for refusing to sell their earthenware pots at a Pagan celebration. This being Spain, there are many treasures exchanged between clerics from Spain and the Americas. These range from exquisite to kitsch (my guide describes them universally as dull). Christopher Columbus is, naturally, a revered historical figure in Spain. His tomb (left) was originally in Cuba but repatriated to Seville at the time of the revolution. The sarcophagus is an imposing exhibit on the south east side. 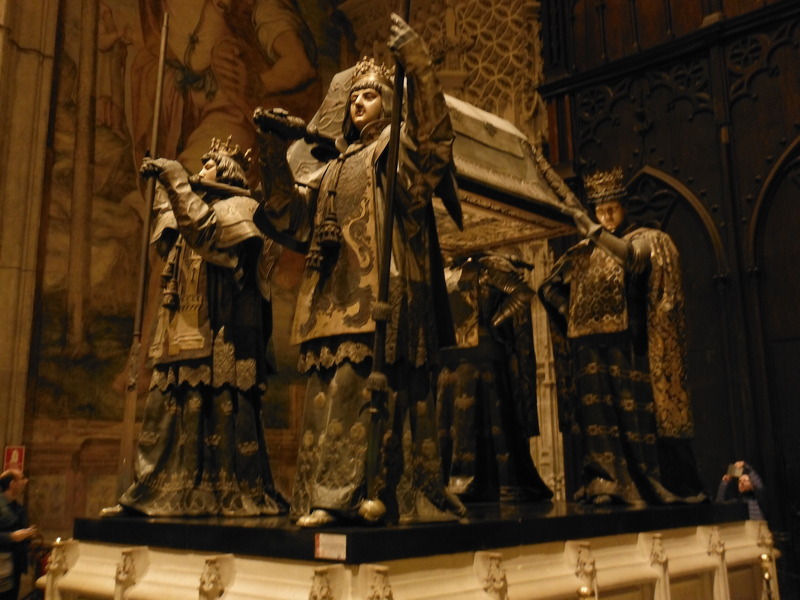 The coffin is held aloft by four figures representing the kingdoms of León, Castile, Aragón and Navarra. It’s a selfie paradise. Adjacent to Columbus one finds – what my guide describes as – the masterpiece (right) of the Cathedral, the central altarpiece (Capilla Mayor). This is debatable. It is certainly impressive and is, apparently, the life’s work of the sculptor, Flemming Pieter Dancart. 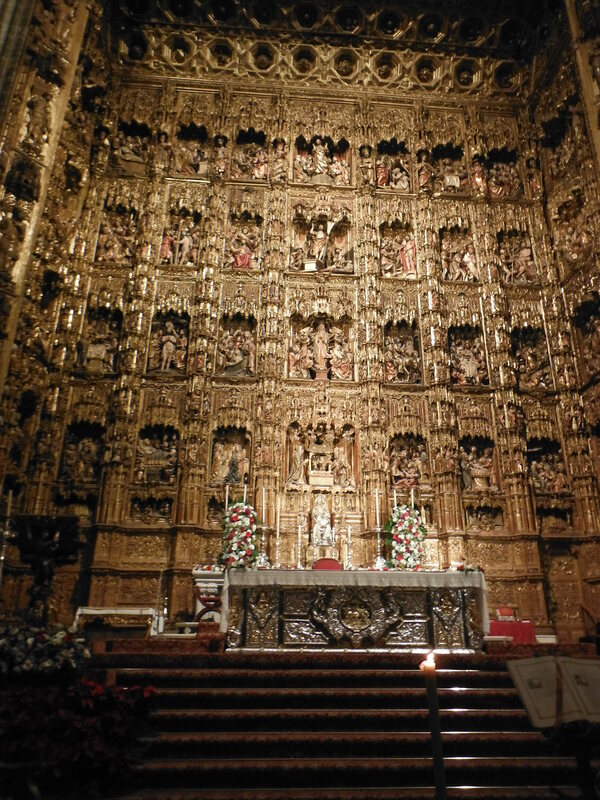 There are 45 carved scenes of the life of Christ, intricately carved and guilded. Unfortunately it is defended by an enormous iron gate (as are many other altarpiece in the cathedral) which really prevents one from studying the panels in any meaningful way. This cathedral is not the Sagrada Familia in Barcelona. It is austere and cold. Hushed. Next stop, the Alcazar. I’m writing this in the queue. Looks like a few hours are needed!